There are long captions on these maps so remember to hover your mouse over the image to see them. Nothing like a good back road to spice up a visit to the desert! Once again we decided to try out some of the roads in Joshua Tree NP designated four-wheel drive only . On this trip I am traveling with a nice laptop with a decent screen but I also have an iPad, and the difference between the resolution of google maps on the two devices is dramatic. I scoped out some roads leading into the park from the south on the iPad and could barely find them on the laptop later when we returned to the MoHo. These screen shots are from the laptop, since getting iPad screen shots to the laptop is time consuming, and if you are looking at the imagery on your own device, you probably wouldn’t see any difference anyway. It’s also helpful that the battery life on the pad is reasonably long, much longer than on the iPhone even when Google maps is up and running. The other very helpful detail is that if I open the map and load the imagery while I have a good connection, later when the iPad says “No Service”, I can still see the maps and still see that magical little blue dot moving along the landscape letting me know exactly where we are. Now, of course I can read a paper map. Of course I can find myself on the ground with a paper map. I used paper maps and USGS quadrangles and old fashioned aerial photos to map soils in rugged, often wilderness areas. That doesn’t keep me from loving GPS and Google Maps any less. That moving blue dot is magic! I have used all sorts of GPS units in the last ten years to document data points, but I still love that moving blue dot on my iPad. Love it! We found Berdoo Canyon road leading north from Dillon Road east of Desert Hot Springs. We could see that the road meandered up the washes and squirreled around some tight turns in the depths of the canyon before emerging on the bajada and continuing to an intersection with the Geology Tour Road in the park. The first few miles the old paved road parallels a wash that is usually a better option than the caved in pavement. At the lower reaches of the canyon, we saw people shooting and evidence that this is a pretty popular place for target practice. We had a great time for the first few miles, negotiating a couple of tight turns around boulders, and a few nasty big rocks in the roadway, and continued following the washes east. Before long we encountered a big Hummer full of people who had probably paid good money for the Hummer Desert Tours, and then a few minutes later we found another big Hummer full of people. They were all bundled up in their big coats and hats, enjoying the wait while their tour guides fixed a big Hummer flat tire. We wondered what they thought of two women in a little Tracker going up their expensive tour road, but we just waved and kept going. After about 6 miles and a good 90 minutes, we came to a bad rough patch of rocky road that would have been a serious challenge to the clearance of the Tracker. We walked it, and were pretty sure we could do it, but had no idea what was ahead of us. I could see on the iPad (remember I had No Service!) that we were almost to the end of the difficult part of the canyon, but we also had no clue what was ahead on the big alluvial fan leading north. It could have been completely washed out for all we knew. Sigh. I can’t believe I didn’t take any photos of this part of the road, either. They were big rocks! Honest! Rather than taking a chance, we decided to give it up and back track out of the canyon. On our previous day in the park, we had planned to drive the Geology Tour Road, so we made a beeline back to Desert Hot Springs, up through the Moregno Valley to Yucca Valley and the western entrance to the park. By this time it was about 3 in the afternoon and the estimated time to drive the Geology Road is two hours, but we really wanted to see just how far we could get and how close we could come to our stopping point. We stopped at the visitor center for a geology tour map and when I talked to the ranger about Berdoo Canyon Road he pulled out some photos of how hard the road was. Darn it if he didn’t show us a photo of the part we almost went through as the worst part of the canyon. We could have made it! The tour road was interesting, and sure enough the Berdoo Canyon Road took off south across the fan. We were excited, but the sun was against us and by the time we started up the bajada toward the canyon the sun was setting. Sigh again. We were within a couple of miles of our previous end point, but we both knew that we could have made it if we hadn’t chickened out. Neither of us had any desire to crawl into that canyon and try to get back through it in the dark. As we drove back north toward Yucca Valley, I commented that in spite of the late clouds there wasn’t much of a sunset, nothing good enough to stop the car for a photo. But then, about half an hour after the sun went down, the sky lit up with rose and purple and pink and we were treated to some breathtaking moments. You can bet I stopped the car to get the last light of the day silhouetting the fantastical shapes of the old Joshua trees. Another day in the desert, another road that we will have to come back and try again. The night was clear and the moon was just less than full to accompany another swim in the hot springs pool this morning. Only a couple more days and we will be heading back north. Sometimes for no reason at all, I miss the desert. Most often, it is during the winter, when much of the desert near us is also in the throes of winter; high desert sage covered with snow and hunkering down under biting winds. When we arrived at Desert Hot Springs on Friday afternoon, the skies were cloudy and it was raining lightly. It wasn’t the desert that I envisioned, except perhaps for the pungent scent of creosote bush in the rain dampened air. All desert dwellers and visitors know this smell, and most of us love it. We left San Diego in the rain that morning, choosing to drive through Julian and down highway 78 into Borrego Springs. The drive is steep and winding, but nothing too difficult to handle. Jeremy wasn’t too happy about it, though, and kept trying to figure out how to get comfortable on his dash perch while Mo negotiated the curves. We had an especially good reason for taking this route through Anza Borrego to DHS. Laurie and Odel were camped in the state park and on this soft rainy day were hanging around at home so we could visit. What a treat it was to share some of Laurie’s great carnitas tacos and a glass of wine while we caught up a bit. It was wonderful to see old friends on the road before we continued north to our destination. On Saturday we relaxed a bit and drove west on the freeway to check out the Premium Outlets, something I haven’t had a chance to do in the past. I am glad I didn’t think I was going to do any great shopping there. It seems that the only thing around are clothes, clothes, and more clothes, interspersed with shoes and more shoes. It was spectacularly boring. Even Chico’s was sad. It seems that the Chico’s outlet stores don’t sell overstocks of their regular stuff and have made a bunch of cheap ugly stuff for the outlet (cheaper) stores. Ugh. I got away from the mall without buying anything but a nice red silicone scraper for the kitchen. I won’t need to do that again. Even though we come to Desert Hot Springs to stay, it isn’t particularly this part of the desert that I miss. There is traffic, there are lots of people, and there is desert garbage. There are telephone poles and windmills, cell towers camouflaged poorly as palm trees, and of course actual palm trees. There are all kinds of desert dwellers, with chain link fences around properties filled with old furniture and cars, and estates that look like something from another planet surrounded by iron fences and huge gates. Still, this isn’t the desert I miss. But yesterday, once again, I found the desert that calls to me when I am far away in the high precipitation zone of the Cascades. With the promise of a mostly clear day ahead, we drove east to the south entrance of Joshua Tree National Park. From the southern entrance of the park, not far from Interstate 10, there are many miles of narrow road winding through the warmer, drier Colorado Desert before you reach the more well known areas with weathered granite boulders and the huge yucca plants that are Joshua Trees on the higher, moister Mojave Desert zone. We were in the baby car, a nice change from our previous visits to the park in the MoHo, giving us the chance to meander, and to explore the roads designated for 4-wheelers. A stop at the Cottonwood Spring visitor center was rewarded with a printout of things to do in the park if you have a dog. That was so refreshing, since we are used to the usual restrictions against taking dogs just about anywhere in a national park except the parking lot. We could walk our dog on any road, including the dirt roads that are in many areas of the park that are rarely frequented by everyday visitors. We decided on the Old Dale Road, exiting from the main park road about a third of the way in, and leading off into an endless vista of desert. Not a car in sight, not a telephone pole or a fence that I could see for at least 50 miles distant toward the Coxcomb and Sheep Hole Mountains. We crossed the Pinto Basin, speeding up for deeper sand, negotiating the washboards and just soaking up the open skies. This is it. This is the desert that I miss. Open space, silence, a road ahead with no cars in sight. Mo and I both have memories of the deserts around Lancaster and Victorville, east toward Antelope Valley, and up toward Barstow when they looked as wild and empty and fresh as this desert before us. Memories of a single pair of car lights at twilight, visible at least 20 miles away as you drive down a long grade to nowhere. No More. That part of the Mojave now is filled with traffic and cars and smog and trash everywhere you look. It takes the foresight of a government willing to set aside National Parks and wilderness to keep landscapes looking like this one. Always. My children’s children can come here and see the desert as it once was. If they are lucky, it will be a clear day like this one where the smog from the south hasn’t permeated even into the wild lands of Joshua Tree. We made it about twelve miles in before we were stopped by some serious rocks and ruts that required a bit more 4 wheel drive than we wanted to do in the tracker. Parking at the base of the Pinto Mountains, we hiked up to the park boundary. The Old Dale Road continued over these mountains and down the other side to 29 Palms, but we wouldn’t be making the round trip as originally planned. Back to the main road to continue north toward the campgrounds, we passed Ocotillo Flats, with ocotillos looking like dead empty sticks of nothing in this time before spring bloom. A few more miles led us past the brilliantly backlit Cholla Gardens. Do you know a single photographer in the desert who can resist photographing these “teddy bear cactus” when they are backlit by the sun?? Not me! We drove through the campgrounds, deciding that there would be plenty of room for a dry camp stay in Jumbo Rocks. We saw many more little nooks and crannies and places that we could hike and play in the rocks on a cool winter day. 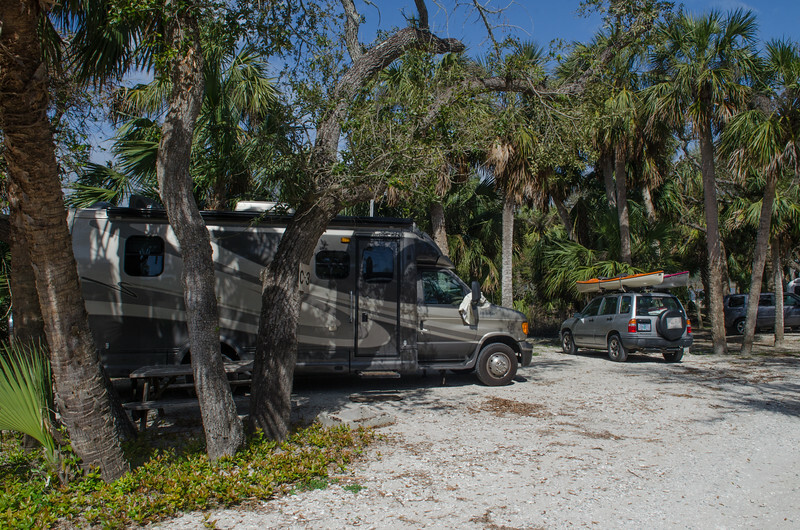 Even in what should be high winter season, the campgrounds were less than half full. Next time we will plan for a few nights here when we come south. The afternoon was waning, and we decided to save our other chosen 4 wheel drive route for a later day. Instead we drove the short 20 minutes out to Keys View for a breathtaking vista of the Coachella Valley and the magnificently rugged mountain ranges all around us. The San Andreas Fault stretched below us to the west, one of the more dramatic views of this great creator of the California landscape. The sign at the the viewpoint had a photograph of the usual smog that covers the area, and a photo of what it might look like on a clear day. We had the smogless day, and even with the clouds that hid Mt San Jacinto from view, the wild ranges that we could see stretching in all directions were stunning. Traveling the northwestern route out of the park toward Yucca Valley, we realized that it would be dark when we got home. Mo said, “How about a pizza?” I liked that idea and as we reached Joshua Tree I fired up the iPad to search for pizza. The town of Joshua Tree yielded up only one place, Sams Pizza, and Yucca Valley had only a Domino’s. We haven’t had any luck with Domino’s so Sam’s it was to be. We drove back and forth a couple of times along the 29 Palms Highway and could only find Sam’s Market and Indian Food. Finally in the fine print, in a sign in front of a tiny strip mall we saw it, Sam’s Indian Food with pizza and subs in the fine print. Hmmmm. Indian food is great but be wanted pizza. The tiny restaurant turned out to be delightful, and the pizza was great, with a crust that was a bit more like naan than pizza crust but completely delicious. The drive back home was short and sweet, and coming down that long grade into Desert Hot Springs was much less daunting than the first time we drove in the big rig. The twinkling lights of Palm Springs welcomed us home after a truly perfect day in the desert. Mission Bay RV Park, San Diego, California; High 68F Low 57F, light rain. I can hear rain on the roof now, after a day of warm air and clouds over the ocean. The predictions have changed over the last few days, with only one thing in common. Tuesday was to be our best sunny day, and it was. The last two days have been cloudy, but still warm, at least to us. I noticed that many of the comments for these days in San Diego are affirmations of what a great place it is to visit. Hard to imagine that in so many years of living in California I visited San Diego so rarely, and remember almost nothing about it at all. I must have been a young teenager the last time I was here. We have enjoyed ourselves, but haven’t done so much that we are exhausted and overwhelmed. I could see how that could happen here. It is a big city with a great deal of art and entertainment, and a lot of outdoor space to do outdoor things. If we had our bikes and kayaks with us, we would no doubt be exhausted by now, but we decided on this trip to leave them behind. No matter the destination, it is hard to dig the kayaks out of the snow and load up the bikes. It is a bit like grocery shopping when you aren’t hungry, sometimes hard to imagine what you want to eat. In the same way, it is hard to get excited about biking and kayaking when the temperatures are single digits. If we come back here, you can bet we will be sure to bring both bikes and kayaks. The last two days are still a bit of a blur. Some things stand out, especially the neighborhoods. We did some of the normal sightseeing things expected of San Diego visitors, but we also wandered down unknown streets discovering lovely surprises along the way. One of the best was the area called Mission Hills, a neighborhood west of the more talked about Hillcrest area, and just up the hill from the famous Old Town San Diego. A web site that I later found when searching for information called it “the neighborhood you dreamed of before the world changed”. There were broad sidewalks, and beautiful old bungalows from the 20’s, small and tidy and lovingly refurbished, and not a for sale sign in sight. We spent the afternoon yesterday exploring Balboa Park, home of the San Diego Zoo, but also home to 14 world class museums, countless manicured gardens, fountains, and pathways meandering through the wooded hills just minutes from the central part of the city. We had Abby along, and decided against trying to see the museums, but one could easily spend a long day just exploring this beautiful park. Later in the afternoon we drove through Hillcrest and Mission Hills to arrive in Old Town San Diego at just the right time for an amazing Mexican dinner at Fiesta de Reyes, with gas lit fires scattered around the patio to keep us cozy in the cool evening. The morning rain was light today, and the skies lightened enough mid day to make our trek to Coronado quite lovely. We drove across the Coronado Bridge and I searched for the small home where I lived as a four year old. I can remember what it felt like, and remember the policemen bringing me back when I “ran away” to the beach just two blocks away. I think I found the street. It will be fun to go home and search for the old letters that just might have the address of that little house on them. We drove south to Imperial Beach, within view of Tijuana, and on this gray day, I could find very little about it that was appealing. We drove back north to find another well known Dog Beach, where Abby could play ball and I could just sit and listen to the ocean. The Dog Beach is adjacent to the Naval Base and is actually on military property. It was a bit confusing trying to figure out exactly where to go, and the signs were not very clear at all. The military gate guard was helpful though, and pointed us in the right direction. Later we parked closer to the Hotel Del Coronado, an amazing landmark on the southwest perimeter of the island. The hotel has the distinction of being the largest wooden building still standing in the US. Since it was a cool afternoon, we left Abby for a bit while exploring the lobby and grounds of this famous site. The woodwork was impressive, and everything was lustrous and beautiful, but the interior of the main part of the hotel was really dark! All that gorgeous dark wood from the late nineteenth century can be a bit oppressive. Much has been written about this wonderful old hotel, and the gift shop was amazing with a special emphasis on Marilyn Monroe, who stayed here during the filming of “Some Like It Hot”. The hotel was well featured in the movie. We opted for an ice cream cone from the hotel sweet shop and were a bit aghast that two single cones cost us $12.65. Sheesh. Then as we explored the sun deck overlooking the beach, we saw the burgers went for merely 15.95 each, and even came with a pack of potato chips. At least they were Kettle Chips. It was lovely when the sun came out, and for a short time the beach lit up a bit. I still would much rather be camped in my MoHo than staying at this beautiful old hotel. We drove back into downtown San Diego to explore the much touted Gaslamp District, only to discover that much of what makes this area fun to visit are the restaurants and the night life. The restaurants lining the street were busy with folks eating outdoors, and the sidewalks were lined with folks from the nearby convention center, identified by their matching dangling name badges. We walked a few blocks but since we weren’t ready for more restaurant eating, there wasn’t that much to keep us there. Instead we drove a few more blocks to search for another well known area called “Little Italy”. Once again, the restaurants and eateries seemed to be the major form of entertainment. In spite of the descriptions of “boutiques and shopping”, there wasn’t much to entice us to park and walk again. It might have been because it was a cool winter day, but there didn’t seem to be much going on in this area either. It is surprising how close all of this is to our little spot in Mission Bay, with the Pacific Highway leading right from downtown, past Old Town and Sea World, past the turn to Fiesta Island and once again home at the RV park. Almost anything of interest in the main part of the city is within fifteen minutes or so of the park. I can see how San Diego would be a nice place to live if you liked cities and all that they have to offer. It is a nice place to visit, for sure. But I do notice that I am feeling the pressure of people and the lack of open space. I am ready for the next stage of our little getaway to begin, starting tomorrow morning when we hook up the Tracker and head east for the desert. The rain has stopped for now, and I am finished with my latest book. How long has it been since you read a book that was amazing for its language? I found myself wanting to reread and highlight passages just for their eloquence, and for the feeling they gave me. When so many books lately are quick reads that are simple entertainment, it was wonderful to slip into the magic of prose that lifted me from everyday life. Remember Margaret Atwood? I read “The Handmaid’s Tale” a very long time ago, but just found another old novel of hers, “Cat’s Eye”. It was a haunting story of a difficult time in a girl’s youth, but the writing itself is what made the book sing. Tonight, rain on the roof. Tomorrow, rain in the desert. But still, it isn’t snowing and it isn’t freezing, and rain or shine, the desert hot springs pools are waiting. It doesn’t matter a bit that we have to drive several hundred miles, almost the full length of the state of California. Doesn’t matter a bit that for much of that drive we are traveling through the hazy warmed up fog/smog that blankets the Central Valley for much of the winter. Doesn’t matter a bit that we must drive over the Grapevine with bumper to bumper semi’s jockeying for position. Doesn’t matter one whit that we decided to drive straight through LA on I-5 to get south to San Diego. Whatever it takes, it is worth it to get south to the sunshine and blue skies that were waiting. We left Lodi after a leisurely breakfast, knowing we had only 250 miles or so to reach our destination at the Orange Grove RV Park just east of Bakersfield. We were really happy to see that much of the surface of I-5 has been redone since our last trip south and even with the smog, oops, I mean haze, it was wonderful to soak up the sunshine pouring in through the windshield. Before 2:30 in the afternoon we pulled into the park and settled into space 177 at the far end of the row near the back. We were also delighted to discover that there was a free RV washing area. With a huge bag of oranges that would cost as least five bucks and a free RV/car wash that would cost another ten bucks in quarters, our “real” cost of spending the night at this non Passport America park came to about 18.00. With the orchard fruit picker provided at the camp office, I managed to fill a giant cloth grocery bag in just a few minutes. Yum. The smaller oranges on the outside perimeters of the trees were sweeter, and for the last couple of days I have made some delicious fresh orange juice for breakfast. With the MoHo and Tracker all shiny and a simple spaghetti supper we were ready to settle in for a great night. Of course, fate just had to mess with us a little bit to keep us from taking too much for granted. After supper I popped in the 3rd disc for the first season of Homeland and was greeted by a strange message on the fancy dvd player/home theater system installed in the MoHo. It has worked fine now for five years, but tonight it decided to jam with the dvd in the drive. We went online to check for a solution, and discovered in the process that the unit is permanently wired into the rig with no sign of a place to unplug it. Mo turned off the breaker and we spent close to a couple of hours taking the whole thing apart while it was still hanging from the cubby hole in the MoHo. We finally gave up and broke the dang thing completely apart to get out the Netflix dvd. That wasn’t much fun at all, and we still have no clue how we are going to replace the unit, or what to replace it with. Thank goodness the TV still works. After a good night’s sleep, we both decided to not talk about the ruined player and went on to have a great day driving south once more. Bakersfield was a smoggy oops hazy, as ever but as we drove up over the Grapevine the haze receded and even going into LA the smog wasn’t bad at all. Even the traffic was bearable going right through downtown. (Mo is listening to me as I proof this, and she just said “That is because you weren’t driving!) There were a few sections of the 5 between the San Fernando Valley and downtown where the lanes were so narrow it seemed impossible for two big rigs to pass, but we managed with only a couple of rather scary moments as big rigs took up 1/4 of our lane and someone was right next to us on honking because we had to drift to avoid the truck. Whew! It looked as though the engineers had made six lanes out of five to make room for more traffic without widening anything to fit . Once we passed Disneyland and Buena Park the traffic thinned out, the lanes widened, and the pavement was again smooth as silk as we rolled on south. A rest stop near Oceanside was interesting, with huge buildings that looked just like beautiful California missions, but were only big bathrooms made to look like missions. We used the iPad maps (I refuse to download the iOS 6 so I still have google maps on my iPad) to go directly to the RV park without a hitch. We knew that using our Passport America card for a discount meant that we would only be able to stay through Friday morning for the half price cost of $25 per day. We also knew that we couldn’t make a reservation using the card, but Nina’s assertation that this was the low season here proved true and the park was only about half full. In no time at all, we were settled in. Although the park itself is basically a big asphalt parking lot, the sites are big, there are shade trees all around, and there is great security. The best part of this park, however, is the location. Right on a peninsula that juts out into Mission Bay, there are miles of beautiful parks and trails all round the bay for walking, and the incredible dog park at Fiesta Island just a few minutes away by car. It’s a Dog’s Life here in this part of San Diego, and today was all about Abby. We took her around the Bay Walk here by the park, and then drove over the Fiesta Island to find the dog park. The island is mostly brown and scrubby, with a somewhat muddy beach, but the dog park is huge, really huge, and is all green and grassy, and the beach that is within the dog park was much cleaner. After some time on Fiesta Island, we drove around the Bay and crossed one of the more than 300 bridges in San Diego to discover the Dog Beach at the funky old hippie town of Ocean Beach. Even though dogs are restricted to the evening hours on the main beach, the Dog Beach is open and leash free all the time. What an amazing place, with soft white sand and lots of space and waves. I spread out a big towel and sat in the sunshine while Mo and Abby played ball for a long time before I took a turn. I had as much fun watching all the other dogs as I did playing with Abby. Later in the afternoon we explored Ocean Beach in the car, but didn’t see much that made us want to get out and wander. Driving north to Mission Beach had much the same result, but finally farther north at Pacific Beach we found a parking spot and got out and walked the Beach Walk. So far, San Diego has been a winner, at least this part has been. We are reading about the various neighborhoods throughout the city and are planning a day at Balboa Park tomorrow. Rumor says it is a great dog friendly place, and should be fun even without a visit to the famous San Diego Zoo. The goal is to stay loose, enjoy our sunny stay here in this new to us city, and not try to fit in so much that we end up feeling rushed and overloaded instead of relaxed. The snow started way back in early December, gave us a beautiful white Christmas, and didn’t let up. When it did finally stop, the temperatures plummeted to morning lows near zero for days in a row and clear sunny skies that warmed up to all of 12 degrees. It has been great fun. Mo and I did a lot of shoveling and plowing, managed to move almost 6 cords of free wood that we inherited from a neighbor, and kept the fires burning and the house cozy and warm. I love winter. For awhile. I have had some knitting and quilting time, and truly enjoyed the ability to telecommute for work when the roads were icy and treacherous. I finished the queen sized quilt I have been working on for a few months and took it to the quilter. I almost finished a soft luscious shawl for Melody, just waiting for the hand dyed silk to arrive for the fringe. I almost finished a baby quilt that I will deliver next month to a beloved friend about to have a little boy. But enough is enough! Every night when we go to the hot tub, the bare feet freeze on the porch and the entire ten feet of distance from the back door until we are in the hot water is a challenge. No matter how beautiful the pristine cold snow looks outside my window, and no matter how warm and cozy we are with our wood stove, I am tired of it. I am ready to be somewhere warm. I am a bit tired of the thick fence of icicles between me and the view out the bedroom window. Yesterday we loaded up the dog and the cat and and supplies for our escape and drove the two hours over the mountain to the cottage and the waiting MoHo. Instead of temperatures in the teens with clear skies, we drove into temperatures in the 30’s with icy fog shrouding everything. It is one of the famous temperature inversions that make the cold winter fogs of the Rogue Valley legendary. At the cottage, there wasn’t a speck of snow on the ground, but that icy fog is COLD! Mo said, “Are you complaining about the weather here too?”. Well, yeah, I guess I am. I am envisioning warm sunshine, not icy roads and steely gray skies. We had most of the afternoon at the cottage to fiddle around a bit, and Mo decided to tackle the moldy cupboard wall that she wanted out of the kitchen. It kind of reminded me of those shows on HGTV where they take a sledge hammer to the walls. It is sort of fun tearing a house apart. While we were demolishing the kitchen wall, the roofer was outside tearing off the 4 different layers of roofing down to the rafters. The cottage was built in 1926, and wasn’t a high end build even then, but underneath all that stuff, we found what looks to be solid, beautiful redwood beams. Kinda nice. We enjoyed a simple supper, a game of cards, and some evening reading before turning down the heat for the night. Saturday morning would come soon enough. This morning, the icy fog was still thick as we hooked up the MoHo and headed south of the Five. First, however, we decided to stop for a good breakfast at Elmer’s, close to the interstate onramp. It is the second time we have had breakfast there and it wasn’t a fluke. The restaurant is wonderful, with really great food. Again we split a breakfast of potato pancakes with applesauce, bacon and green onions, applewood bacon and great coffee. We were on the road by 9:30 with an estimated time of arrival at Flag City in Lodi around 4:30. I think we pulled in here at about 4:15. The drive was lovely. Traffic was light, the I-5 surface has been redone since our last trip south, and once we were out of the Rogue Valley, the temperature inversions were behind us. By the time we got to Redding it was 65 gorgeous, sunny, luscious degrees. As we rolled down the road, both of us realized that the destination is almost irrelevant, it is just that desire to get rolling that makes it what it is. The Journey, not so much the Destination. Although I think the destination is nice, and we are looking forward to it, it wouldn’t be nearly as much fun to just fly south. It is the road. I may have said this before, but the realization always seems to come to me anew when we get back on the road. I love the movement, the changing scenery, the companionable silence of rolling down the road. We covered an easy 375 miles today, rolling right through downtown Sacramento without a hitch. We took a chance without a reservation for Flag City, and when we arrived, in spite of a big group being here, there was a nice, level pull through waiting for us for $27. (half price) with our Passport America card. Tomorrow another day on the road, an easy 250 miles or so before we pull into the Orange Grove RV Park near Bakersfield. I am looking forward to those sweet oranges everyone keeps talking about. I really hope the cold snap hasn’t wiped them out!